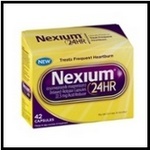 With millions of satisfied users, Nexium is the "little purple pill" that works to heal the causes of Acid Reflux. This proton pump inhibitor turns off the "pumps" within the digestive tract that produce acid, bringing 24-hour relief of heartburn. Because it's tested, proven, and affordable, Nexium is our top choice for fighting Acid Reflux. Acid Free-Flux is one of two Acid Reflux products offered by Native Remedies. The company has a stellar reputation for providing homeopathic products that work, and that are backed by an unparalleled 1-year money-back guarantee. Acid Free-Flux can be used regularly or on an as-needed basis by patients of all ages. Prilosec was one of the first over-the-counter products for frequent heartburn and other symptoms of Acid Reflux. It uses the proton pump inhibitor known as omeprazole to bring you relief in the long run, over a two-week course. Nearly 95% of users reported that the product worked for them, so Prilosec is likely to have similar results when fighting your Acid Reflux too. Zegerid is one of several omeprazole-based products for Acid Reflux on the market today. Unlike its competitors, it adds sodium bicarbonate to the formula, which allows the active ingredients to be more easily absorbed and bring relief from heartburn and other symptoms. Users say that Zegerid is effective when used consistently. But, you'll pay almost twice as much for this Acid Reflux product when compared with similar medications. DigestoCalm is the newest Acid Reflux product offered by Native Remedies. Administered as an oral spray, rather than the more traditional pill/capsule form, this product can be used by people of all ages. DigestoCalm is still too new to have much user feedback, but the product is covered by Native Remedies' excellent 1-year money-back guarantee. Digestinol is an Acid Reflux product that uses aloe vera plant extracts to help soothe symptoms and heal the underlying causes of the condition. Some customers have used this product with great results. However, it is the most expensive option in our review, and the company's return policy only lets you get a refund on unopened bottles.